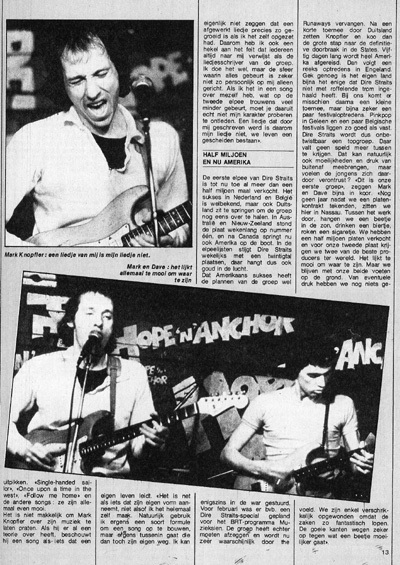 I recently got an old Dutch magazine called JOEPIE from February 1979 with a two-page story about Dire Straits. 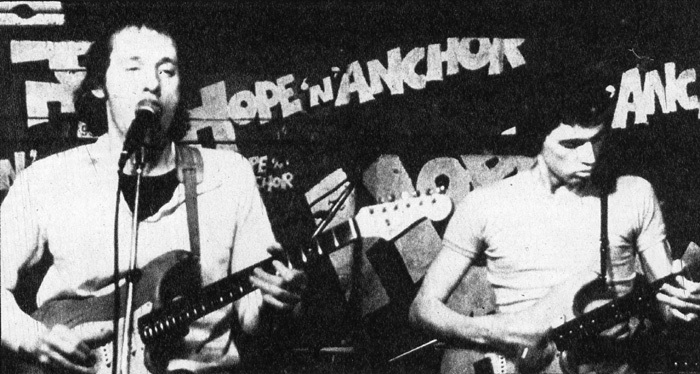 It features two pictures that show the band on stage at the Hope & Anchor pub. Dire Straits played there several times in late 1977: on September 10 (in the evening after they played the Clapham Common gig in the afternoon of that same day), on November 4, 11, and 18, and on December 9 (when Eastbound Train was recorded, released as a b-side of the Sultans of Swing single). It is not possible to tell from which of these gigs the pictures are but I am almost sure that it is not from the one in September (David’s hair is shorter than on the pictures we have from the Clapham Common gig earlier on the same day). The first picture can also be found in the Dire Straits book by Michael Oldfield (which also features some more pictures of the same gig). It shows Mark with his 1961 Stratocaster, before the guitar was refinished to red. The guitar had a natural wood finish (possibly sealed with clear laquer). By the way, I know that this is the 1961 Strat because of a typical mark in the pickguard at the upper end of the middle pickup. The body does not have a strong attractive grain, like ash bodies normally have. It looks very much like alder which was the standard body wood at that time. 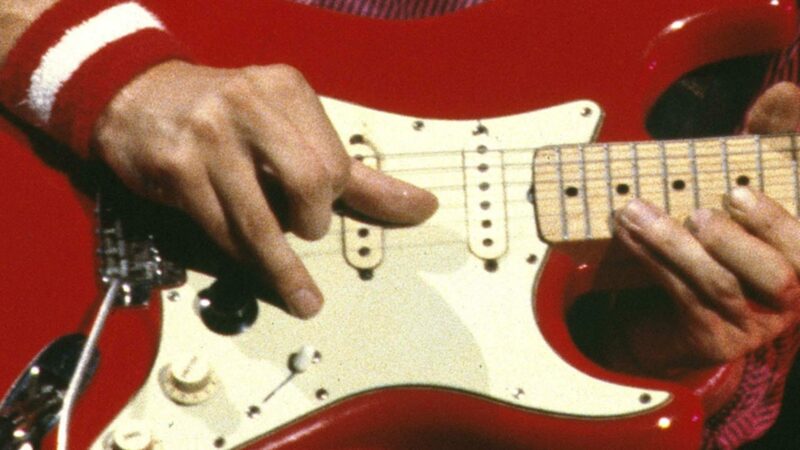 Note that David’s guitar also had a natural finish, I strongly assume that both Strats were refinished one year later, about summer 1978, Mark’s to red, David’s to black. Of the few pictures that show the guitar in the original condition this is possibly the best we have. Unfortunately the quality is rather poor so we cannot see too many details of the guitar.In the lower right corner of the picture we probably see a part of an amp. I assume that this is David’s amp, the knobs look like Fender or Music Man. With the help of some imagination 😉 we might see a part of Mark’s Vibrolux amp between Mark and David, there might be the plug of the guitar cable and a few knobs (the Vibrolux has dark brown knobs without a silver center plate), but this might be illusion as well (any other amp than the Vibrolux would be real surprise at this period).